→ Article: Some thoughts on Springfield mounts. Hands up! How many of you have knees that don’t bend like they used to? How about backs that don’t like twisting and bending? Well, here is an answer! So I got to thinking (as my wife tells me, a dangerous pastime), what about a Porter –Springfield (PS) GOTO mount? 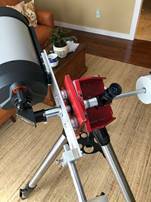 For those of you unfamiliar with the PS mount concept, it is an equatorial mount that projects its light cone thru a hollow declination axis to be intercepted by a secondary mirror coincident with the RA axis. In this fashion, the EP always stays centered around intersection of the RA and Declination axis’s and so, no matter where the scope points, the EP remains stationary. This means you can sit down at the eyepiece, and no matter where the scope points, you don’t have to shift position. Add GOTO to this and you have the answer to all your doctors and chiropractors’ cautions. 1.You need a fair amount of back focus depending on the mount design. 2.If you use a Newtonian with a fixed image plane (as in the pic above), longer focal lengths are necessary in order to obtain the necessary ‘back focus’ without an unduly large secondary mirror. And because the bulk of the Newtonian is effectively revolving around where the focuser would normally be, heavy and cumbersome counterweights at the opposite ends/sides are necessary to counterbalance the OTA in both RA and dec. Short focal length Newtonians ie” less than F8/F10) are not practical due to the oversized secondary obstruction necessary to intercept the light path close enough to the primary to ‘project’ it out to the PS focal plane. 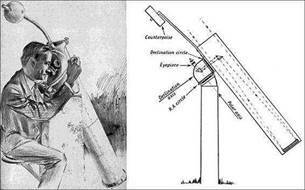 3.Refractor tubes would need to be shortened to free up the necessary back focus necessitated by the PS design. Longer focal length refractors are more suitable as their narrow light cone is easier to field and keeps the downstream component diameters reasonable. Also, the bulk of the scope would be out front, necessitating that the CWs go below – the opposite of the Newtonian above. 4.SCT’s are perfect in as much as their moving mirror focus mechanism means you can compensate for differences in focal plane easily, and their typical F10 light cone is easy to field. Like the refractor, the CW’s end up being below. Although I sacrificed a dilapidated B&L8000 to this proof of concept (it did work), I felt it was a lot more intrusive than most people would feel confortable committing to – even if it was reversible (with some scarring mind you..) So I experimented with how to employ a variant that required no changes to the SCT OTA. 6.Standard mounts do not lend themselves to PS use because they do not have the necessary hollow DEC axis to pass the light cone. So following are the trials and tribulations of fabricating a GOTO Springfield mount. What limited Springfield resources exist show dedicated castings being machined. This is not within my, or most other peoples, capabilities. So I chose to make mine out of slabs of ½” and 1/4 “ aluminum. Aluminum is remarkably easy to cut with a miter saw and a carbide blade. A little WD40 or paraffin wax along the cut line results in a nice clean cut. 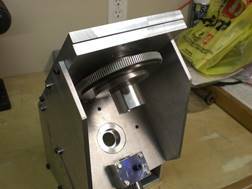 However, you will either need a metal lathe or have access to someone that does to make some of the necessary components. The real design trick is to keep the Dec. bearing thickness to a minimum in order to limit the back focus necessary. Any bearing type will work for the polar/RA axis, but I chose to make it hollow to provide for a polar alignment scope. I chose to go with ‘plate bearings’ on both axis. This design offers wide bearing diameters for stability while keeping the thickness to a minimum. The thrust bearings used are readily available on eBay and cheap. They’re available in a wide range of diameters and are nice and thin – approx.. 4mm. I machined a groove in matching sets of 6x6x1/2” aluminum plate so serve as bearing races. In retrospect, I could just have easily used a larger set of the same type of plate bearings I used for the axis hold-down thrust bearings - just larger in diameter. But I have a lathe and 4 chunks of aluminum was a lot cheaper than a couple of 5” diameter needle thrust bearings. It’s a lot easier to purchase worms and gears than to attempt making them. They come up fairly regularly on the Astro sites, orphans from various deceased equatorial fork mounts.. The original PS design had a fixed diagonal on top of the RA housing near the eyepiece that could be adjusted for tilt/tip. I opted to forgo this and instead opted to use a couple of standard 90* star diagonals. One in the OTA tailpiece, and one in the declination axis provide the necessary ‘alignment’. If you’re out a bit, it will show up as a bit of field rotation when slewing. Unless you’re doing astrophotography – not a big concern. I used nylon thumbscrews in the dec axis diagonal so it could be ‘snugged, but was still free to slip and maintain its vertical position (other wise, it would turn with the dec axis..). I introduced a couple of locating pegs to prevent it rotating. This design is scalable. A larger aperture SCT would only require more offsetting counterweights in Dec and RA. I’m not sure how much back focus would be available on larger aperture SCTs. After all, they all use the same accessories, so back focus may be proportionally less in larger aperture scopes. My design requires about 6” of back focus to accommodate the PS mount, plus ½ of the OTA diameter…. This method allows any SCT to be adapted to a PS type mount without any alteration to the OTA. I am not an optical engineer, but what little I have read (and understood) on the web indicates that varying the back focus this much can introduce spherical aberration into the image. Also, some vignetting at the primary baffle tube may occur as the primary moves closer to the secondary in order to ‘throw’ the image plane backwards by the required amount. I will have to do some testing and comparisons. Initial daylight tests don’t show anything obvious. I’ve still got to fit worm gears for slo mo and axis locks to make the mount more user friendly. 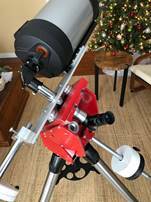 The original shot of the bare aluminum mount showed a set of Meade LS gears fitted, but I ended up selling those – but it shows how they mount. I’m awaiting another set coming in. Hopefully, this scope will find it’s way into a fixed observatory (still in planning stages). But listen up all you scope manufacturers out there! – We old guys collectively represent a large demographic that all have the same problem – we’re getting old….A commercialized Porter Springfield mount could be your next big thing! Our club'sC14, housed in an observatory, uses a mount with a "last align" command to use a previous 2-star alignment. Rock and roll! Very interesting, and a nice writeup! I had realized quickly that such a mount would require a high f/number when I saw the original at Stellafane. It hadn't occurred to me to adapt such a mount to a SCT. This has major implications for the physically handicapped, not just the aging, since the eyepiece is fixed and more space is available UNDER the scope. How Funny. I just started a thread in my local astronomy club asking why Springfield telescopes aren't more popular. Great minds think alike. I think the answer to the vignetting issue (which I have since verified, but not quantified) would be a relay lens. This would allows the SCT focus to remain close to factory specs for infinity, but project the image further down the optical path. As stated, I am not an optical engineer. I have read that an achromat of X focal length, mounted at 2X from the image plane, will 'relay' the image without enlargement or reduction a further 2X beyond the relay lens... If I need about 6" of additional back focus, this would suggest a really lens of about 38mm FL mounted about 75mm away from the image plane. For the inner diameter of my housing, this would mean a lens with an F1 focal ratio.....!! So I'm not really sure where I am at this point..
Just for kicks. A local guy I know really well loves Springfield’s. He has what may be the largest one in the nation. It is a 12”.....possibly f5. Currently he is building a 17.5”. He is an amazing engineer. He loves the design. When he brings this to our star party he invites many friends. It takes about 3-6 hours to set up. I know he has had this one and a baby brother 8” setup in his backyard for months at a time with a tarp for protection. His is push-to with SLO-mo controls. It is fun just to sit and follow things along. It tracks very well and has amazing views. I can’t wait until he finishes his 17.5!!! Now that he is retired he might get it done quicker. Here is a link from many years ago. I wish I would have documented the setup. Nice out of the box thinking, that is begging for a relay lens setup to get the image past that DEC bearing. I think that bino objectives are typically around 150-200mm focal length. To use one as a relay lens, I would need to mount one 300-400mm from the standard SCT focal plane, and then the image would be relayed a further 300-400mm beyond that to the new fiscal plane.. That would provide additional back focus of 600-800mm - much more than is required. Don't know if I'm missing anything in this whole equation..
Eyepiece projection would probably work (without knowing what the spacing requirements would be however), but it sound like you'd essentially be magnifying the image along the way. I think the idea was to follow a barlow with a focal reducer, with a 2" reducer you could have wide field of view on a 1.25 eyepiece.